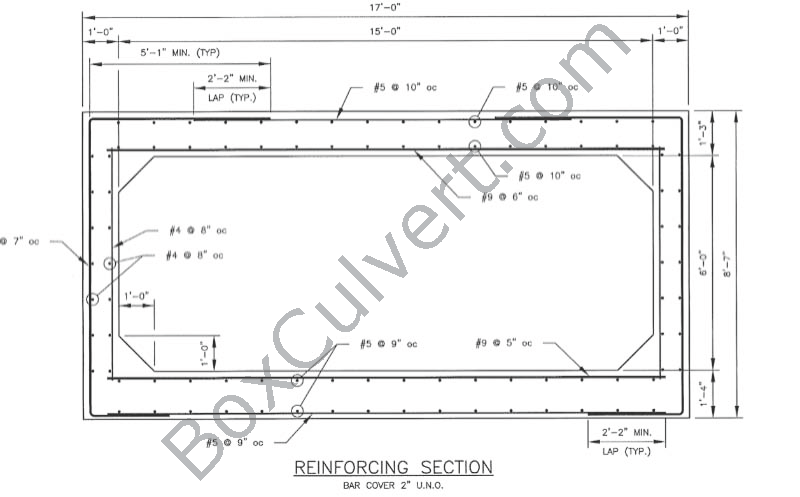 Precast concrete box culverts are steel reinforced. The steel is typically welded-wire fabric (Grade 65) or rebar (Grade 60). ASTM C 1433 provides measurements that show wall thickness and haunch size along with the recommended steel reinforcement. There are several accepted ways to install the reinforcement and going by the chart and overburden can appropriately size the amount of steel reinforcement needed. However, every project involving precast concrete box culvert should be designed and stamped by a licensed professional engineer in good standing. Each precast concrete box culvert has different loads associated depending on site conditions and use. These conditions include but are not limited to burial depth, vehicular traffic, military loading, and AREMA Cooper E-80 railroad impact loadings. The burial depth and loadings can create a need for greater reinforcing and is the reason why a licensed professional engineer should design. A typical reinforcement diagram can be shown below. The box culvert was buried less than 36" below finished grade and was designed for Cooper E-80 AREMA impact loading. You can see that the reinforcement in the precast concrete box culvert is significant and that same reinforcing along with quality concrete will help ensure a life cycle of at least 100 years.